Art and decor are not lost on football enthusiasts, quite the opposite actually. 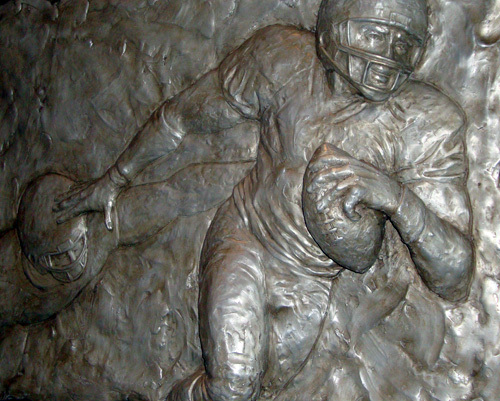 The prestigious Cherry Lion Studios created the football action sculpture in this photo, which is one of many pieces of art throughout Georgia Dome, home of the Atlanta Falcons. This particular piece adorns the walls of the Owner's Club on an upper level of the Dome, along with another piece titled "Falcon." Cherry Lion has created art for numerous sites around Atlanta, including the "World Athletes Monument" at Pershing Point on Peachtree Street; "Hope" at the Carter Presidential Library; and the 65-foot salmon at Atlanta Fish Market on Pharr Road.